Review date: 6 September 2004. 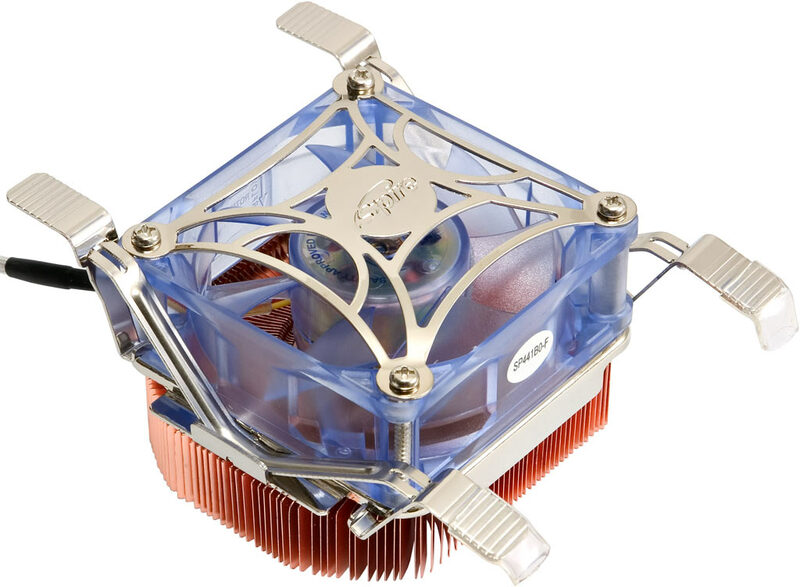 Pentium 4 coolers used to be quiet. Thankfully, many of them still are. Intel went with a retention-frame heat sink mounting method for their P4 sockets (the original Socket 423, the semi-obsolescent Socket 478, and the don't-buy-it-yet LGA 775), which allows those heat sinks to be really big without ripping the processor off the board. The big sink also means these coolers can have 70mm-diameter fans as standard equipment, versus the 60mm fans on earlier processors. All things being equal, a 70mm fan will be significantly quieter when moving the same amount of air as a 60, and it's easier to make coolers with even bigger fans (80mm units are popular on high end coolers) if you're starting from a larger area. P4s also all have a nice big heat spreader on top of the chip package, which makes it easier to effectively mate a CPU cooler onto them. There's a (relatively) small piece of silicon under that big spreader, and you'd get the very best thermal contact by giving it a light misting of thermal goop and lovingly applying a dead flat polished copper heat sink directly to it. But in the real world, where amateurs install heat sinks, and heat sinks seldom have dead flat bases, and people like to apply thermal goop like peanut butter, heat spreaders are the way to go. They work better when a cooler's installed in a slapdash fashion. It's no coincidence that AMD's 64 bit chips, and their coolers, all look broadly similar to P4 gear. The ease of making a decent thermal solution is a big part of the reason for this parallel evolution. All of this also explains why Intel's stock coolers for all of their P4s are, generally speaking, quiet. Not silent; people building lounge room PCs, or people who're rabidly opposed to fan noise for some other reason, still need to make different arrangements. But, for most people's purposes, the stock Intel coolers work fine and don't make too much noise. If you're running a current high-end P4, though, you may find yourself wanting something that works as well as the stock cooler but makes less noise. And if you're overclocking a current high-end P4, you're pretty much definitely going to want something better than stock to cool it, unless you've got an exceedingly well ventilated case that'll probably be a noise hazard in its own right. Every overclocker worth his or her salt knows that the very hottest of the P4s, the Prescott-core chips, are not the way to go if you want to run faster than stock. You have to pay a bit more to get a Prescott at the same stock clock speed as the older Northwood (well, in Socket 478, anyway; LGA 775 Prescotts are priced like Socket 478 Northwoods, to try to trick people into taking that big upgrade step), but you actually get less performance per megahertz from Prescott, and less overclocking headroom. For some tasks, the Prescott core's 1Mb Level 2 cache may let it nose ahead of Northwood, but for practically every customer, the older, cooler chips are the obvious choice. "Cooler", though, is a relative thing. A 3.2GHz Prescott P4's got a Thermal Design Power (TDP, the most power it can reasonably be expected to draw over an extended period, according to Intel at any rate) of 103 watts at stock speed. Anything over a hundred watts used to be the domain of loony overclockers; now it's unremarkable. At the same clock speed, a Northwood's TDP is only 82 watts, thanks in no small part to its considerably lower transistor count - the extra half-megabyte of L2 cache on the Prescott needs a lot of transistors. 82 watts is still plenty of heat to dissipate, though. If you doubt this, I invite you to hold a running 75 watt incandescent light bulb in your hands for a while. That'll be wasting only about 65 watts of its input power as heat, and it'll be emitting it over a rather larger surface area than that of a CPU, but I bet somebody who taped your hands to the bulb could have you confessing to acts of witchcraft in no time. If you manage to overclock a 3.2GHz Northwood to, say, a pedestrian 3.5GHz, and you have to push another tenth of a volt into its core to get there, you'll be looking at a TDP up past a hundred watts. So. There's lots of heat, and it's tricky to get rid of it, big heat sinks or no big heat sinks. You certainly wouldn't expect a low noise, low profile, reasonably cheap CPU cooler to be any good at cooling overclocked P4s, would you? This is Spire's typically melodically named SP441B0-F CoolWave, which is made to cool any Socket 478 P4 you can buy today, and then some. And it's quiet. And it's a low profile cooler - the whole thing stands well under 60mm above the CPU (a tad less than 50mm, if you take the fan's finger guard off). So you should be able to cram it into various funny little Small Form Factor and two-unit rack-mount cases. I was impressed with Spire's previous CopperStream and CopperStream II coolers, which have a pretty conventional design - vertical flat fins with a fan on top. They fins were very thin and made from copper, I grant you, and the end result was some darn good P4 cooling without much racket, but the basic size and shape of the CopperStreams is not dissimilar from that of various other tweaky coolers. The SP441B0-F is altogether funkier, thanks to its own special take on the thin-copper-fin heat sink idea. Spire claim there are 160 fins on this thing. My commitment to journalistic veracity is insufficient to induce me to verify this claim. There certainly are a lot of them. And they're swirly. This is not a new phenomenon. Quite a few swirly-fin heat sinks exist; Intel have been using them as stock sinks for some time now. Most swirly-fin sinks, though, have thick aluminium fins. They often have fins that curve in two dimensions, for a vortex effect - the SP441B0-F fins curve only one way. 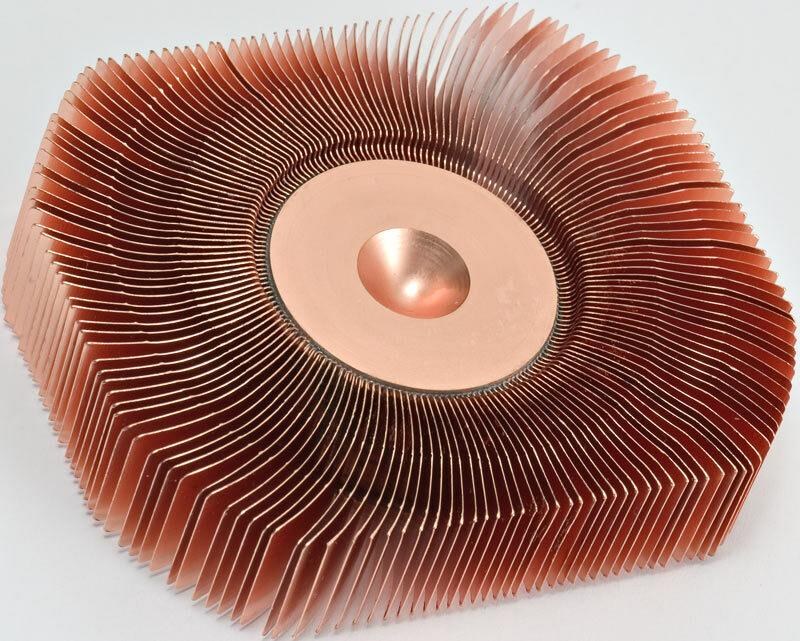 But the Spire fins have all of the good qualities of thin copper fins (high thermal conductivity and large surface area per unit volume of heat sink), plus the basic good quality of swirly fins in general. Swirly fins, to some extent at least, match the swirling airflow from the cooling fan, reducing wasteful turbulence and increasing the amount of air that actually passes between them. Lousy air flow through the heat sink is the reason why various large, loud and impressive looking CPU coolers have failed to actually work very well; it's easy to make a crummy cooler if your design process follows the Detroit Sports Car Formula - "more metal, more power" (and leaf springs?!). The SP441B0-F's low profile design shouldn't be much of a problem, since much of the metal in a lot of CPU heat sinks (even the well designed ones) more or less goes to waste. The thermal path to the outer portions of large fins, and to all of the fins far from the CPU contact point, is typically difficult enough that 25% of many coolers' fin area is likely to do precisely 75% of the cooling. Thin-fin copper heat sinks are always a bit delicate, and this one is particularly so. You have to handle it somewhat carefully, and you shouldn't expect the ends of all of the fins to be perfectly evenly spaced. But there are so darn many fins that it's not hard to hold the sink by its edges without squishing them (for the bed-of-nails reason), and the cooler's retention frame is designed to press only on the cylindrical solid copper middle of the sink. The frame also has finger-holds on both sides of its triple-piece clips, and the clips are captive (they can't fall off the fan frame), and the finger-holds on one side have helpful traction-enhancing shrink-wrap tubing on them. All of this meant that I had no trouble at all installing the SP441B0-F on my test rig, and on a real CPU. The cooler comes with only a tiny multilingual instruction leaflet, but that should be all that even a novice will need, as long as they don't go too nuts with the thermal goop. 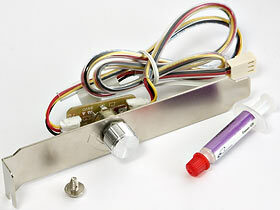 Along with the heat sink and fan assembly, the SP441B0-F package gives you one of Spire's usual neat little syringes of white thermal goop, and a speed controller for the fan. And, pleasingly, a screw to retain the controller's speed-knob bracket in an unused expansion slot in the back of your computer. At full power, the SP441B0-F fan has a rated power of 3.6 watts. Its running power consumption will probably be a bit lower (fan power ratings generally tell you how much they draw when they're getting up to speed), but it's still a medium power fan, with a medium noise rating - 34.5dBA. That'll probably be a one metre, free-air noise rating. Putting a fan on a heat sink will generally make it a little louder, but putting it inside practically any computer case will make it a lot softer. 34-point-whatever A-weighted decibels isn't very loud, anyway, as I can confirm from running the fan myself. This cooler doesn't cut it as a silent computing solution with the fan at full speed, but bury it inside the average performance PC, with noise from its power supply fan, at least one extra ventilation fan, and possibly also high end 3D graphics card that adds its own music when it's working hard in 3D mode, and you'll probably have a hard time figuring out whether the SP441B0-F's actually plugged in or not. If you want quieter, of course, the SP441B0-F can do it. At minimum speed, its fan's rated power drops to a silent-computing-approved 0.96 watts, with a noise level of 23.5dBA. That genuinely counts as whisper-quiet. If you live in the country and the wind ain't blowin' then you may be able to hear a 23.5dBA-at-one-metre noise source inside a computer case a metre away. But possibly only after you unplug the refrigerator at the other end of the house. The speed controller is transistor based, like most fan-throttlers these days. It's well enough made, and the potentiometer turns smoothly. It ain't gold-trimmed Japanese exotica, but it'll do. OK, so far so good. Does the blighter actually work? At full power, the SP441B0-F turned in a highly creditable 0.41°C/W performance on my test rig - exactly the same (as far as my CPU-simulating test rig can tell, anyway) as the larger, but quieter, CopperStream II at full power. This is, indeed, good enough to keep hundred-watt-plus P4s cool, but not in all circumstances; if the ambient temperature's high, or the airflow through the case isn't very good, I wouldn't count on the SP441B0-F keeping a top-spec P4 out of thermal throttling mode. You've got no business running a hundred watt CPU in a case that doesn't have at least a couple of throughflow cooling fans, though. With two or three quiet case fans on top of a quiet PSU fan, the SP441B0-F ought to add nothing noticeable to the system noise, and be OK for any P4. Well, as long as the ambient temperature isn't way above SATP. If your P4's only got a TDP around the 80 watt mark, then the SP441B0-F at full power ought to give you considerably more leeway in the clogged-intake-dust-filter, stinking-hot-computer-room, case-stuffed-full-of-cables departments. Wound down to minimum power, the SP441B0-F scored a rather less exciting 0.56°C/W. That's still not a dreadful result, though. Intel changed their stock Socket 423 and 478 coolers often enough that it's impossible to give a standard score for them, but 0.56°C/W ought to pretty much line up with the performance of the basic non-copper-cored stock coolers that come with P4s up to the 2.4GHz mark and beyond, so you should have no trouble using a SP441B0-F on such a chip, or on a Celeron running a bit faster. The new Prescott-based Celeron Ds, for instance, are excellent performers for the money (previous P4-socket Celerons managed less than 70% of the speed of a similarly clocked P4), and their much smaller L2 cache means they run a great deal cooler than a "full" Prescott. You wouldn't need to turn the SP441B0-F up far from minimum power to keep an un-overclocked Celeron D cool in a very unremarkable case. Spire coolers are pretty easy to find around the world. My review SP441B0-F came from Lownoise PC here in Australia, who sell it for $AU45 plus shipping. Delivery will probably bring the total to about $AU53 for Australian shoppers, plus or minus 50 cents depending on where in Australia you live. Aus PC Market sell the same cooler, or will when they get stock of it, anyway. Their delivery-included price is $AU55. The SP441B0-F is not a new amazing world-beating overclocker's cooler, freshly stolen from the gods. It offers, however, more than adequate performance, silence if you want it, ease of installation, and a decent price. And it looks groovy, and it's not very tall. Which may or may not matter to you. Review SP441B0-F kindly provided by Lownoise PC.